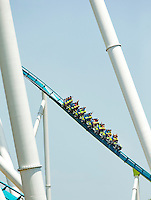 Photography of the Fury 325 , a steel roller coaster at the Carowinds amusement park located in Charlotte, North Carolina and Fort Mill, South Carolina. Carowinds Fury 325 reaches a maximum height of 325 feet (99 m) making it the tallest and fastest Giga Coaster in the world and the 5th tallest overall. Coaster riders reach speeds up to 95 miles per hour (153 km/h).